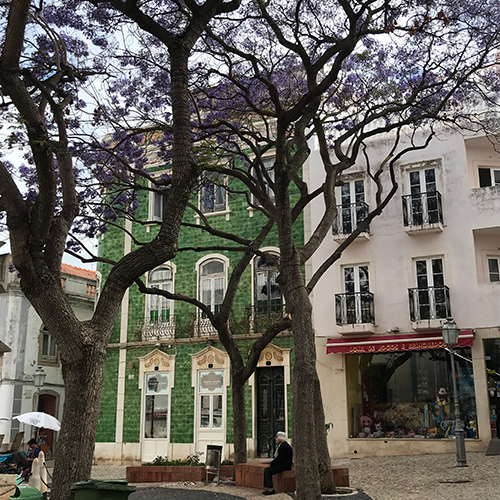 There’s not much better than a vacation along Portugal’s incredible coastline… but add in a road trip along that coastline, and you have one of the best European summer trips imaginable. The gorgeous pool at the Conrad Algarve. All photos by Loukia Zigoumis. There is nothing like travelling to Europe in the summertime. From the culture to the history, to the food and lifestyle, there’s so much to discover, no matter where you go. 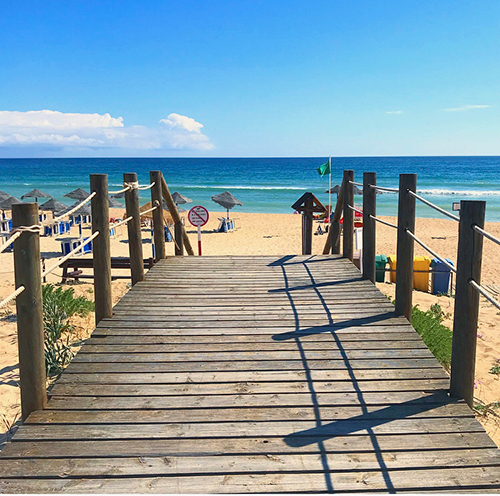 One spot though that seems to gleam even brighter in the summer, and happens to be one of Europe’s hottest destinations right now, is Portugal. I just returned from a short trip to the southern part of the country, where I toured around on a little road trip. 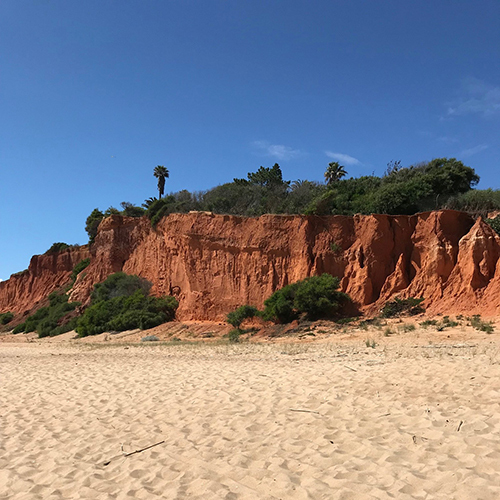 Starting with a stay at the luxurious Conrad Algarve hotel, located near the tourist-fave Quinta do Lago, and Casa Mae, a unique boutique hotel in Lagos, my trip (in a sleek Jaguar I-PACE no less), was simply breathtaking. Read on for the must-sees and must-dos (and get ready to pack your bags, asap). Located along the Atlantic Ocean coastline, the Conrad Algarve is the perfect hotel for couples and families looking for a place to get away from it all—it’s also the perfect hotel for golf lovers, as the Algarve district is home to some of the best golf courses in the world. 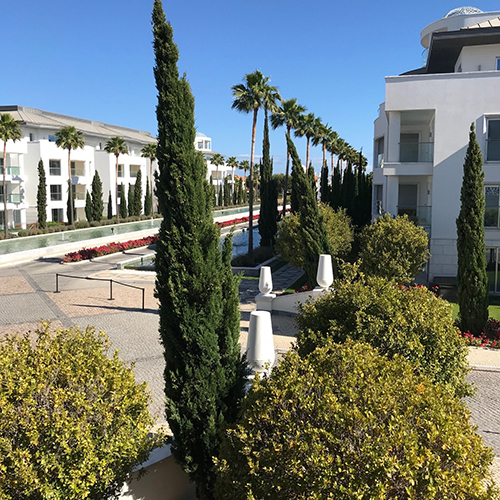 The Conrad Algarve is a quick two hour drive from the Lisbon airport (check out our guide to Lisbon’s best neighbourhoods here), and a twenty minute drive from the Faro airport. And once you’re there, you’ll instantly feel those vacation vibes. 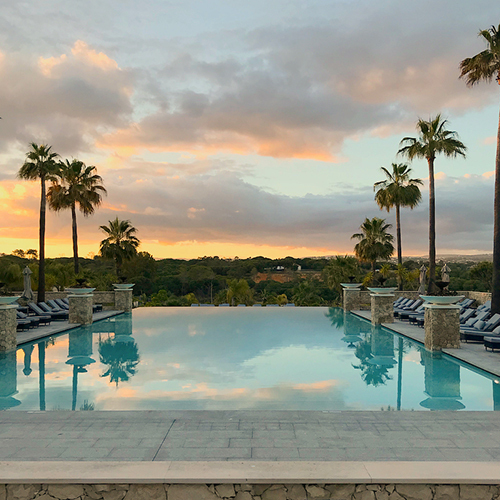 Airy rooms and open spaces, an infinity pool, plus a large lagoon-style pool surrounded by cabanas, loungers, and the stunning mountain views Portugal is known for will truly help you unwind and relax to the core. Not to mention this luxurious hotel has a spa, as well, with private infinity pools, a variety of body treatments, saunas, and ice fountains. If you’re travelling with young children, they can escape to the popular kids club while you indulge in some much-needed spa time. You can’t beat the beach in the Algarve. 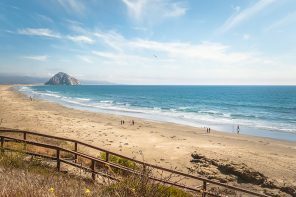 Although it’s not located right on the beach, the hotel has shuttles that will run you down to the sand and surf. The beach was perfect for swimming, sun-tanning, and just taking in the stunning view. There is also a restaurant and bar on the beach to complete your visit. A road trip always provides ample photo ops, especially in Portugal. Since the Algarve is not only known for its culture, but also its cuisine, I definitely needed to feast; the food was delicious, from the buffet breakfast to the fresh seafood for dinner. The Mediterranean-style restaurant, Gusto by Heinz Beck, is a must for food lovers, and you seriously can’t go wrong with any of the shellfish dishes done in traditional Portuguese style. From the Conrad Algarve, we drove through the mountains, went on an off-roading adventure, and even raced around the Autodromo Internacional do Algave in our I-PACE (a thrilling experience) before checking into the unique Casa Mae hotel in Lagos. Casa Mae boasts it’s more than a hotel; I have to agree. 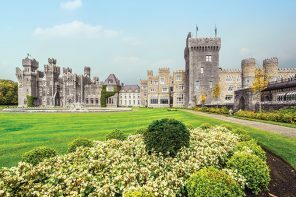 This is perhaps one of my favourite hotels I’ve had the pleasure of visiting, because of its charm, friendly service, and airy, breezy rooms. Casa Mae was an abandoned estate by the sea which was turned into a hotel, offering guests a quiet place to stay while visiting Lagos. I could have stayed for weeks, exploring the city’s golden cliffs, town square, and rocky beaches. It’s beach vibes all around at Casa Mae. Casa Mae is a very sustainable hotel, where the owners aim to make it a community driven, socially engaged, and environmental conscious place to stay. 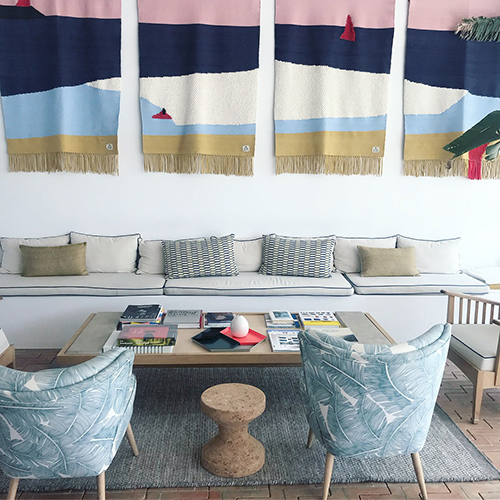 90 percent of what you’ll find at Casa Mae is made in Portugal, from the products sold in the hotel’s store, to the furniture and toiletries in the rooms. I had the chance to dine at Orta restaurant, and I loved that the food served for breakfast, lunch, and dinner is all home-grown and home-baked by the hotel’s experienced chefs. You can also explore their vast garden to see all the food they grow, and cooked in the best farm to table tradition. The streets of Lagos hold that incredible Portuguese charm. You can choose the style of the room you want to stay in, as well: minimalist, boho chic, or vintage. Each room offers something unique depending on your mood and style, and rooms are scattered among three buildings. I stayed in the newest building, and loved the minimalist look of the room, filled with local crafts, homemade soups and shampoo, and a perfect hammock to relax in on my balcony late into the night. No matter your room, you’ll be met with the same sunny vibe, and personalized service. It was truly the most uniquely beautiful experience. The Jaguar I-PACE provide the perfect getaway car for the road trip. 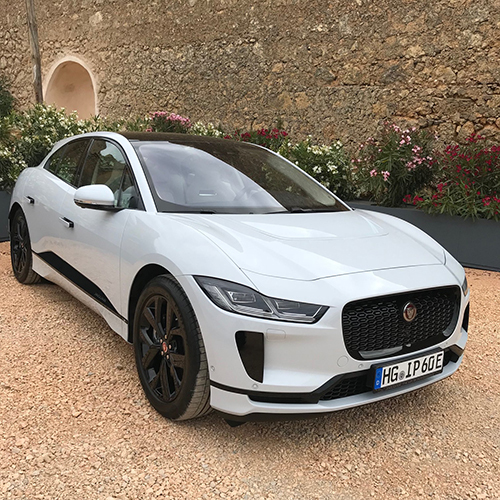 Keeping us on track was Jaguar, as they launched their brand-new all-electric vehicle. The backdrop of Portugal was the perfect place to put this vehicle to the test. What’s great about this car? It’s the first luxury car brand to come out with an entirely electric car, one with zero tailpipe emissions, no CO2, and no particulates. When it comes to travel and wanting to leave a smaller carbon footprint along the way, this is a great option when road tripping (read more details about my I-PACE test drive here). Loukia Zigoumis graduated from Carleton University with a degree in Communications and received her diploma in Broadcast Journalism from Loyalist College. After spending several years working in television and radio, and interning at CBS TV in Washington, D.C., she started working in Communications. Loukia is a travel and lifestyle writer who can be found blogging about hotel reviews, cars, beauty, and fashion at loulousviews.com. She is a contributing writer for various publications, including Ottawa At Home Magazine, Canadian Geographic Travel Magazine, and LUXE Magazine Ottawa. When she's not dreaming up her next vacation she stays busy taking care of her two boys. 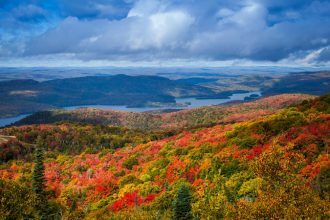 1 of 6Quebec’s Mont Tremblant is best known as a winter playground for those who love skis, snowboards and saunas….